City crews Wednesday removed a plaque referencing Jefferson Davis, former president of the Confederacy, from Horton Plaza Park in downtown San Diego. The existence of the plaque became known through a Change.org petition that called for its removal. The city of San Diego took action several days after a confrontation involving white supremacist groups resulted in the death of a woman in Charlottesville, Virginia. While Confederate symbols have been taken down across the U.S. over the last few years, the events last weekend hastened the removal of even more monuments. According to the petition, the replacement was taken down at some point after veterans raised objections, but was re-installed in 1956 as part of a wave of Confederate monuments in the years following the 1954 Brown v. Board of Education U.S. Supreme Court ruling. The plaque was taken down three years ago to make way for a renovation of the park. Mayoral spokesman Craig Gustafson told City News Service that the plans called for the retention of historical elements from the 1910-30 era, including the plaque. No objections were raised over the course of 10 public hearings on the project, he said. 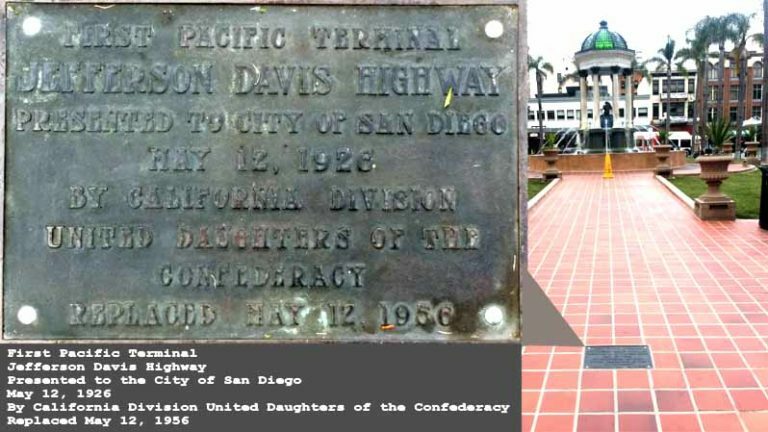 The Public Works Department’s Facilities Division removed the plaque and will return it to the United Daughters of the Confederacy, according to Gustafson. Ward also tweeted his thanks to residents who brought attention to the plaque and to the mayor’s office for its quick action.